Researchers have developed a wireless brain interface that allows monkeys to control the movements of a robotic wheelchair using their thoughts alone. The breakthrough suggests that similar interfaces could allow severely paralyzed individuals to navigate all sorts of robotic devices with their minds. Prior to this study, researchers used brain-machine-interfaces (BMIs) to help primates control artificial limbs. But as this new research shows, it’s also possible to take the recordings from cortical implants and use them to facilitate whole-body movement. Though the new research was geared towards the movements of a wheelchair, the findings strongly suggest that more sophisticated robotic devices could be controlled via BMIs, while requiring no physical intervention whatsoever. The details of this work can now be found in Nature’s Scientific Reports. A computer in Miguel Nicolelis’s lab monitors brain signals from a rhesus macaque. Credit: Shawn Rocco/Duke Health. The new study, headed by brain interface expert Miguel Nicolelis from Duke Health, is the first to succeed at using BMIs for whole body locomotion. 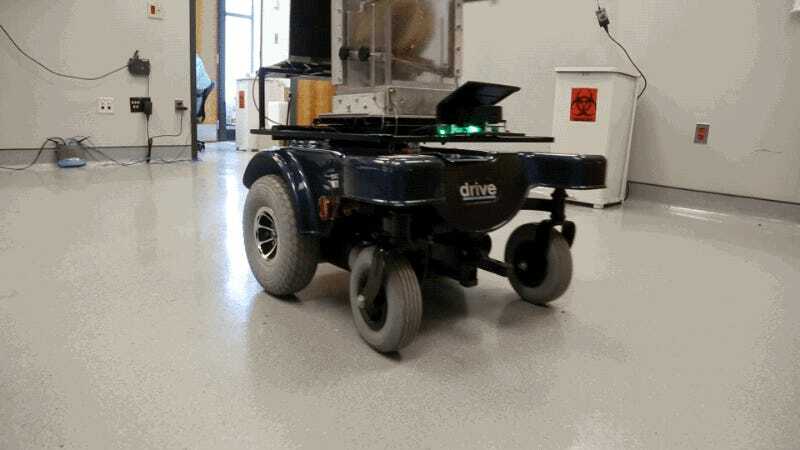 By implanting a wireless, high throughput multi-channel device in the brains of monkeys, the researchers demonstrated that the animals can learn to roam freely with an electronic wheelchair using about 300 neurons. The device allowed them to imagine a trajectory from moment-to-moment and navigate towards a target using the wireless connection. The experiment is part of Nicolelis’s Walk Again Project, which is geared towards technologies that can read the brain waves of paralyzed people and translate them into signals that can control artificial limbs and other assistive devices. In 2014, a brain-powered exoskeleton allowed 29-year-old paraplegic Juliano Pinto to kickoff the World Cup. Dr. Nicolelis contributed to the design. As the new research shows, this is only the beginning. Credit: FIFA. “We are not focused on the wheelchair—we’re actually developing robotic exoskeletons in parallel to this,” he said. “But in principle, it could be any kind of vehicle because this is a general purpose approach.” The system could be used by severely disabled patients to control various “smart” items around the house. The animals were trained to navigate their wheelchairs towards a reward, a bowl containing grapes. The researchers carefully recorded the monkeys’ brain activity as this was happening. Afterward, they programmed a computer to translate the incoming brain signals into digital motor commands that controlled the movements of the wheelchair. Unlike previous experiments in which primates controlled robotic limbs, the monkeys weren’t pre-trained with joysticks. This is important, because people who have lost motor control and mobility due to quadriplegia or ALS can’t use their hands or any others parts of the their body to get accustomed to the system. A monkey collecting his reward. Credit: Duke Health. Other BMIs exist, including non-invasive interface devices driven by electroencephalography (EEGs). Unfortunately, these devices are very limited in terms of what they’re able to control. The new research suggests that, in order to record complex whole-body movements, permanent brain implants are required. For humans, this would mean surgery and potential wear-and-tear of the implant. But as Nicolelis’s research has shown, these implants appear durable and safe. Implants have only been left in human brains for a few weeks or a couple of months, but Nicolelis’s implants are now seven years old. To achieve this durability, the researchers used a flexible hair-like microfilament. After implantation, the array settles slowly into place as its microfibres adhere to the brain tissue. And because the implants move with the tissue, they don’t appear to damage the brain. “This makes us very confident that this new kind of technology can be used in humans very soon,” Nicolelis said. In fact, human trials are likely the next step.